The New York Times: After Ron Paul, Then What? After Ron Paul, Then What? 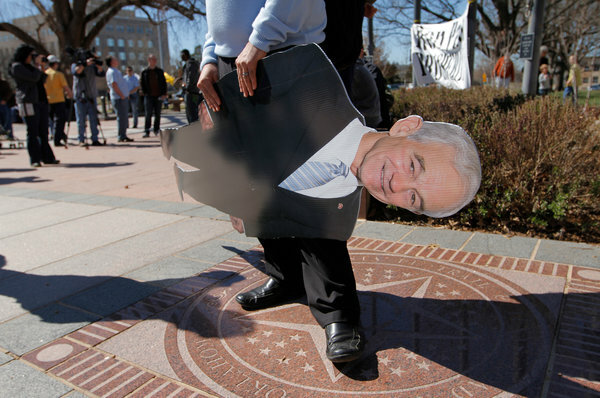 A Ron Paul supporter at a rally in Oklahoma City last year. RON PAUL, Republican of Texas, has retired from the House, after winning more than two million presidential primary votes in 2012. He took the party’s libertarian wing from ignorable fringe to significant faction. His son, Senator Rand Paul, Republican of Kentucky, is angling to lead that faction, very possibly as a presidential candidate himself. The libertarian wing’s dissatisfaction with Mitt Romney led the Libertarian Party to earn 1.2 million votes in the presidential election for its candidate, the former New Mexico governor (and former Republican) Gary Johnson. That was its largest vote total ever. In at least seven national House and Senate races a Libertarian beat the spread between a winning Democrat and a losing Republican. From the Republican point of view, losing the libertarians can mean losing elections. Senator Paul, who sits on the Senate Foreign Relations Committee, tried this week, in a talk at the Heritage Foundation in Washington, to become the voice of a new vision of Republican foreign policy. Rejecting the neoconservatism that has dominated Republican foreign policy thinking since at least 2001, Senator Paul summoned the spirit of George F. Kennan, the author of America’s cold war policy of containment, to suggest that the United States can manage Islamic terror, and even possibly a nuclear Iran, without necessarily waging open war. Senator Paul said that he agreed with those who say that “Western occupation fans the flames of radical Islam.” That opinion turned many Republicans against his father. Senator Paul’s speech pushed a less interventionist foreign policy in terms designed to appeal to Republicans. The Constitution, after all, dictates that Congress, and not the president alone, should decide when we go to war. With the debt crisis, the United States simply can’t afford all its current and possible future military interventions. Fiscal conservatism, by this line of thinking, means peace. Just as his father made “Audit the Fed” a popular cause, Senator Paul told me in January, “I think I can do the same with ‘Audit the Pentagon’ ” and fold defense cuts into his party’s conception of fiscal responsibility. While Senator Paul and Mr. Amash alienate some Republicans, libertarian stands against policies like the bailouts and the federal drug war have potential crossover appeal for Democrats and independents. “If we are ever going to win in California again, or Washington, we need someone who is a libertarian Republican,” Senator Paul told me. The party that nominated Mr. Romney, and that gave only 16 Senate votes in May 2012 to Rand Paul’s five-year path to a balanced budget, might not agree. The consistency of the libertarian philosophy — roughly, that government exists only to protect citizens’ lives and property from assault — leads them to buck party discipline on spending. Senator Paul was among the few Senate Republicans who voted against the fiscal cliff deal. It also leads them to oppose civil liberties encroachments like the Patriot Act and the indefinite detention provisions of the National Defense Authorization Act and to condemn “crony capitalism” as exemplified by the Troubled Asset Relief Program and other government bailouts they see as illegitimately serving Wall Street and banking interests. Ron Paul understood his mission as educational, not just political. He thought more Americans needed to be taught the economic and ethical benefits of a government that pretty much leaves us alone. His successors optimistically think Americans will embrace their libertarianism; more important, they are sure Americans need to, to avoid a fiscal and debt crisis they fear intensely. Mainstream party leaders are blaming failures with technology and grass-roots organizing for their party’s bad results in 2012. The libertarian wing argues instead that Republicans need to separate a core limited-government constitutionalism from the obsessions of other party factions, whether it’s the social traditionalism of the religious right (losing its grip on a changing America) or an expansionist foreign policy (unaffordable and dangerous). At stake, they think, is not just their party’s viability, but America’s solvency. From the libertarian point of view, we might soon be facing the choice of Rand Paul 2016 or bust.